March 26, Irrawong reserve. Meet at corner Irrawong Rd and Epworth Rd. AVGT's 2nd Ever Sustainability Day! 1 Lake Park Road -Pelican Path, Narrabeen. 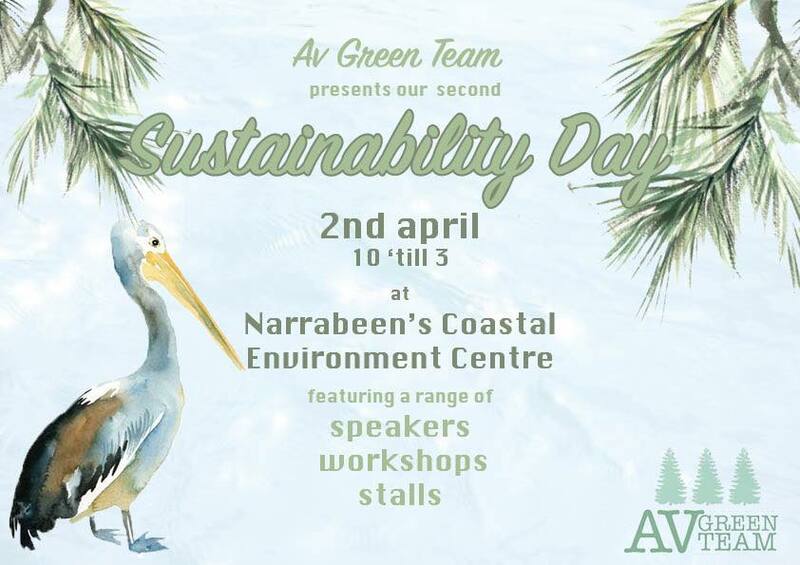 The Av Green Team are hosting our second ever sustainability day! Partly because last time was so fun and also because we are eager to learn more! It will be on the Sunday from 10am until about 3pm. We have a range of awesome expert speakers and workshops covering soil and composting, permaculture, off-grid living, recycling and more! The day will be full of environmentally-friendly stalls and food. Come along (it's free) and will be a great day of learning/eating/moving! Key Biodiversity Areas (KBAs) are nature’s hotspots. They are the most important places left for life on earth. Australia's KBAs are the irreplaceable homes of birds and other wildlife that make our country unique – they are places we love. And many are closer than you might think. Despite their global significance, many KBAs don't receive the protection they deserve. As a result, the health of these special places is in decline. But we can turn this around. BirdLife Australia is working with local communities to improve recognition of the value of these places, and finding solutions to the threats they face. Everyone can play a role in safeguarding the future of Australia’s nature hotspots – will you join us? Thanks to the BirdLife staff and volunteers who generously donated footage for this video: Dan Weller, Andrew Silcocks, Dean Ingwersen, Glenn Ehmke, Wes Cooper, Matt Herring and Reuben Warren. This is a holotype of the new hard coral species Cyphastrea salae. The discovery of a new species of hard coral, found on Lord Howe Island, suggests that the fauna of this isolated location in the Tasman Sea off south eastern Australia is even more distinct than previously recognised. In a recent paper in ZooKeys, Prof. Andrew Baird and Dr. Mia Hoogenboom from James Cook University, Townsville Australia and Dr. Danwei Huang from the National University of Singapore, describe the new species Cyphastrea salae. "The animal itself is quite non-descript from a distance, although it is beautifully symmetrical up close like most corals," says Dr. Hoogenboom. "But we believe this is the first of many new hard coral species to be found in this World Heritage-listed marine protected area." Lord Howe Island is famous for its many unique plant and animal species, known from nowhere else on Earth, including at least four species of palms, nine reef fish and 47 algae. However, the coral fauna remains largely unexplored, particularly using modern genetic techniques. While some of the earliest work on coral reef ecology was done on Lord Howe Island, the species lists were compiled using a morphological taxonomy that has since been revised. "On my very first dive in the lagoon at Lord Howe I knew I was looking at something very special," says Prof. Baird. "Twenty years of diving all over the globe had not prepared me for what I saw. I could hardly put a name on any coral!" Now, six years later, and largely due to the molecular skills of colleague Dr. Huang, the team is ready to name its first species. "Interestingly, Cyphastrea salae looks almost exactly like other closely-related corals. However, its gene sequences are distinct and there is no doubt it is a species that is new to science," says Dr. Huang. The team now have hundreds of specimens to work through, but they are confident that there are more new coral species left to describe. "The Acropora, in particular, look highly promisingly," says Prof. Baird. "There are at least five species that look unlike anything I have seen anywhere else in my travels." Lord Howe Island lies over 900 km south of the next major area of coral diversity, the Great Barrier Reef, and therefore the populations on Lord Howe are highly isolated. Such isolation creates the potential for speciation, however, C. salae is the first new local coral species described to date. The discovery of this new species greatly increases the conservation significance of Lord Howe Island and reinforces the need for strong management measures to protect this unique fauna. High rates of forest clearing in Queensland and Western Australia—with NSW set to follow—act in concert with intense native forest logging as an all-out assault on Australian forest environments says the National Parks Association of NSW (NPA). It’s easy to become blasé about forests when living on the eastern seaboard of Australia, because most settlements (including the large urban areas of Sydney and Brisbane) are fringed by forests and daily life puts millions in contact with forests and forest animals like king parrots and kookaburras. But this disguises the reality that forests are a rare feature in this vast, arid continent. In fact, native forests only cover 15% of Australia. The vast majority of this is woodland, or scattered trees (10% of Australia), with eucalypt forests—those areas that people typically think of as a forest—only accounting for 3% of our land mass and rainforests just 0.5%. Non-eucalypt forests and woodland make up the rest. NPA senior ecologist, Dr Oisín Sweeney said: “despite the rarity of forests, they host a disproportionate number of our favourite animals. Gliders, koalas, quolls, phascogales, brush-tailed rock wallabies, powerful owls—they’re all forest species that are only found in Australia. And they’re all threatened because of the rapid loss and degradation of forests. “In fact, this concentration of species is why the Forests of East Australia are recognised as one of just 36 global Biodiversity Hotspots. It’s incredible: almost everyone living on the east coast of Australia lives in a biodiversity hotspot! “But with this great privilege of living in one of the most special areas on earth comes great responsibility. And so far we’re not taking that responsibility seriously. “We have already cleared close to half of our forests in the short time that Europeans have been here, and we’re still clearing faster than any developed country on earth. What hasn’t been cleared has largely been broken up into little bits or heavily degraded—for example through intensive logging. “We must do better or we’ll find ourselves suddenly regretting the extinction of lots of animals we once took for granted. That would be a national tragedy, because it’s the wildlife that makes Australia unique in the world. Develop a full set of environmental accounts that quantify the value of hidden aspects of forests like water production, carbon storage and wildlife tourism. Without these data we’re making decisions—usually decisions to destroy or degrade forests—based only on partial information. Urgently map the growth stages of forests, particularly those subject to logging. This is vital because the oft-repeated justification for logging is that the trees grow back. That’s just not good enough for the hundreds and hundreds of species that require tree hollows, because only older, large trees have hollows. We urgently need to know the growth stages so that we can assess how much of our forests are now sub-optimal for hollow dwellers and plan accordingly. Reign in land clearing, and instead develop a long-term scheme to identify suitable areas for biodiverse reforestation and incentivise landholders to undertake this reforestation. This will also have the added advantage of helping to reverse regional climate change and protect agriculture in the long term. Youth-run, volunteer-based environment initiative from Avalon in Sydney. Trying to keep our area green and clean! Coal seam gas (CSG) threatens our water, our health and our climate. Many jurisdictions around the world are permanently banning this dangerous industry, most recently Victoria. We do not need or want risky coal seam gas in NSW. It’s clear that the industry has no social licence in our state, yet vast and critical areas—as well as human health—are still under threat from CSG across the state. Call on the new Premier Berejiklian and the new Planning Minister Roberts to follow Victoria's lead and ban this harmful and risky industry in NSW. Indian Mynas - what a pest - like flying rats. Indian Mynas are displacing our native birds. They often nest in and around shops where their food source is. I took this one down this morning in Avalon (no chicks or eggs but I disturbed the female). There were literally hundreds of tiny bits of plastic in the nest which makes you think that all this plastic would be swilling down the stormwater drains into the sea. Have you ever heard of Mahony’s Toadlet? Probably not, given that this little frog has only recently been discovered. We’ve just helped a residents’ group from Kangy Angy, on the NSW Central Coast, get an emergency listing for this rare frog on the NSW threatened species list. Not much is known about the Mahony’s Toadlet (or Uperoleia mahonyi). So far, it has been found at only eight sites, in Myall Lakes, Port Stephens and the Central Coast. Because the species is so new (to science, not to the planet), we were unsure about how it should be protected by law; should it be considered endangered, critically endangered, threatened, or vulnerable? There’s little doubt that it’s rare, otherwise it would have been documented and described before now. But because we still know so little about this frog, it hasn’t appeared on the NSW threatened species list. Late last year, the Kangy Angy Residents Action Group contacted us. A local population of Mahony’s Toadlet was discovered at the site of a proposed new Intercity fleet maintenance facility in Kangy Angy. But the development’s impact on the toadlet wasn’t assessed during the approval process because the species isn’t on the NSW list of threatened species. The group saw that this was a problem, and asked for our help. On behalf of the group, we engaged amphibian expert Simon Clulow, Research Scientist at the University of Newcastle, who is researching the species and is responsible for its identification. We briefed Simon to write an expert report on whether the toadlet should be listed under NSW threatened species legislation. Although Simon’s report identified a number of reasons why the toadlet could be listed, there simply was not enough information to say how rare the species was and how endangered it might be. However, it was clear to us from Simon’s report that the species was eligible for an interim emergency listing. In November 2016, we wrote to the NSW Scientific Committee requesting that the toadlet be listed on a provisional and emergency basis. We also requested the Committee to arrange for further work to be carried out so that the toadlet can be better understood and appropriately listed to ensure its protection. On 6 March 2017 the Committee wrote to us to say that, after considering our request, they had found that Mahony’s Toadlet should be given a ‘provisional listing, on an emergency basis’ as an endangered species. This is both good and bad news. To be listed as ‘endangered’ means the Mahony’s Toadlet faces a very high risk of extinction in New South Wales in the near future. But listing is an important step toward protecting the species. So although it’s sad to add another species to our ever-growing list of endangered species, at least we now have a better chance of ensuring that the Mahony’s Toadlet doesn’t become extinct. This is an example of how EDO NSW can play a pivotal role in connecting communities, scientists and lawmakers to protect a species. If you’d like to help us continue this unique work, why not donate to ourEnvironmental Defence Fund. Your support will help us connect people to help maintain biodiversity and protect the environment. While our cells have an innate capability to repair DNA damage -- which happens every time we go out into the sun, for example -- their ability to do this declines as we age. Treating mice with a NAD+ precursor, or "booster," called NMN improved their cells' ability to repair DNA damage caused by radiation exposure or old age. "The cells of the old mice were indistinguishable from the young mice, after just one week of treatment," said lead author Professor David Sinclair of UNSW School of Medical Sciences and Harvard Medical School Boston. "This is the closest we are to a safe and effective anti-ageing drug that's perhaps only three to five years away from being on the market if the trials go well," says Sinclair, who maintains a lab at UNSW in Sydney. Even on short missions, astronauts experience accelerated ageing from cosmic radiation, suffering from muscle weakness, memory loss and other symptoms when they return. On a trip to Mars, the situation would be far worse: five per cent of the astronauts' cells would die and their chances of cancer would approach 100 per cent. Professor Sinclair and his UNSW colleague Dr Lindsay Wu were winners in NASA's iTech competition in December last year. "We came in with a solution for a biological problem and it won the competition out of 300 entries," Dr Wu says. Cosmic radiation is not only an issue for astronauts. We're all exposed to it aboard aircraft, with a London-Singapore-Melbourne flight roughly equivalent in radiation to a chest x-ray. In theory, the same treatment could mitigate any effects of DNA damage for frequent flyers. The other group that could benefit from this work is survivors of childhood cancers. Dr Wu says 96 per cent of childhood cancer survivors suffer a chronic illness by age 45, including cardiovascular disease, Type 2 diabetes, Alzheimer's disease, and cancers unrelated to the original cancer. "All of this adds up to the fact they have accelerated ageing, which is devastating," he says. "It would be great to do something about that, and we believe we can with this molecule." The human trials will begin this year at Brigham and Women's Hospital, in Boston. They've been looking at the interplay of a number of proteins and molecules and their roles in the ageing process. "While resveratrol activates SIRT1 alone, NAD+ boosters activate all seven sirtuins, SIRT1-7, and should have an even greater impact on health and longevity," he says. There is a new and exciting 10 week art program being run at the Museum of Contemporary Art for people who have dementia. The program, Artful, has been developed by educators at the MCA and in conjunction with Alzheimer’s Australia to encourage older adults with cognitive decline in art viewing and art making. In collaboration with the University of Sydney, research is currently being carried out on Artful to explore the benefits of such art programs to people with dementia, and their carers. If you have any patients, customers or patrons who may be interested in participating in this free initiative at the MCA, please pass on the information, or feel free to display the poster at your premises. So far, the MCA has enrolled 5 rounds of participants in their free program, and the feedback received from participants has been overwhelmingly positive. If you would like to know more about the art program or the research study, please do not hesitate to contact me on the details below. Recognising the importance of consumer involvement in health and aged care will significantly deliver a better and more sustainable Australian health system, the Secretary of the Federal Department of Health, Martin Bowles, said today. Addressing the Consumer Health Colloquium in Canberra, Mr Bowles said while it is heartening that Australians are living much longer increasing numbers of people are now coping with chronic and complex diseases. “In tackling these new challenges we must listen to and value the views of consumers but also understand not all consumers are the same. Some have detailed knowledge of their illness and the health system and some will need help during their treatment. “Fortunately Australians are increasingly more health literate and know more, see more, want more. “Australians are expecting their health care not just to be about price, but also about quality and safety, including medical errors and adverse events. In aged care, it’s about independence, choice, control. Mr Bowles said Medicare is billed more than a million times a day, costing more than $20 billion a year. Mr Bowles said in line with the shift in focus from practitioner and provider, to patient and consumer, in the past year the government has established 31 Primary Health Networks throughout Australia to work with communities to tailor services to local communities’ actual needs. Another major reform is the Health Care Homes initiative. “This is a new coordinated approach that puts the patient at the centre, while supporting sustainability through better coordination of services, less duplication and fewer hospital admissions,” Mr Bowles said. “The Health Care Home model is a more flexible and innovative model of care for patients living with chronic and complex conditions where services are tailored around the needs and goals of the patient. Payment methods are then redesigned to support the new care model. Mr Bowles said there were several streams of reform under way within the health system including hospitals, GPs, Medicare, primary health, PBS, aged care, mental health, workforce and digital health. “Consumer involvement is fundamental to all of these reviews. There are numerous instances of highly effective consumer consultation which has led to policy development that is innovative, of high quality and responsive to consumer needs. Mr Bowles said the Federal Department of Health, which he leads, is working very hard to engage better with others in the health space – consumers, peaks groups and stakeholders. The Consumer Health Colloquium was organised by the peak Australian consumer advocacy group, Consumer Health Forum. A portrait of Australian rugby great, Dr Mark Loane AM MBBS FRANZO FRACS, is the latest addition to the National Portrait Gallery’s permanent collection. The work is the final in a series of three commissioned portraits of Australian rugby luminaries funded by Gallery benefactor, Mr Patrick Corrigan AM. The portrait, a photograph taken by Canadian-born Joachim Froese, shows Loane in a hospital change-room, the setting alluding both to his achievements in medicine and his sporting accomplishments. Mr Angus Trumble, Director of the Portrait Gallery, believes the portrait is a worthy addition to the Gallery’s collection, noting Dr Loane’s successful and meaningful career spanning two very different fields. ‘Dr Loane is fondly remembered for his achievements on the football field as a former captain of the Wallabies, and is greatly admired as an ophthalmologist for his medical work with disadvantaged patients in remote areas,’ said Mr Trumble. Loane made his debut for the Wallabies against Tonga at the age of 18, when he was a second year medical student at the University of Queensland. He is the youngest forward selected to represent Australia since the Second World War, and in all likelihood Australia’s youngest forward of all-time, a fact that remains unconfirmed solely due to the scarcity of pre-Second World War birth records. Loane was appointed Wallabies captain in 1979 against the All Blacks, and led the team to the first Bledisloe Cup victory in Australia in 45 years. Loane retired from rugby in 1982 to pursue studies in ophthalmology (the study and treatment of disorders and diseases of the eye), receiving the Cedric Cohen Medal for the best pass in the eye surgery first pass exam in 1984. Since then, Loane has built his career in medicine with further studies and fellowships. He set up the Cape York Eye Health project in 1999 to provide eye health services to remote Indigenous communities of Cape York. He became a Member of the Order of Australia in 2011 for his work with Indigenous communities in North Queensland. The photograph of Mark Loane joins the two other works in the series added to the Gallery Collection– Ken Catchpole OAM by Gary Grealy and Mark Ella AM by Nikki Toole. The portrait will be on display to the public at the National Portrait Gallery from 10 April 2017. Mark Loane AM, MBBS [Qld], FRANZCO, FRACS (b. 1954) - eye surgeon and former rugby international, made his debut for the Wallabies against Tonga at the age of 18 when he was a second year medical student at the University of Queensland. Mark Loane is the youngest forward selected to represent Australia since World War II and in all likelihood Australia’s youngest forward of all-time, a fact that remains unconfirmed solely due to the scarcity of pre-World War II birth records. By the time Loane graduated 4 years later, he had become the captain of the Queensland state side at the age of 21. He won Test caps against the All Blacks, England, Japan, Fiji and France and toured the British Isles in 1975-76 and 1981-82 and France in 1976. Appointed Wallabies captain in 1979 against the All Blacks he led the team to the first Bledisloe Cup victory in Australia in 45 years and captained the side to the first tour of Argentina in 1979. He captained 6 of the 28 Test matches he played. Considering himself more a doctor than a footballer, Loane retired in 1982 to pursue studies in ophthalmology (eye surgery) where he received the Cedric Cohen Medal for the best pass in the eye surgery first part exam in 1984, then completing the second and final part exams in1986. Further studies and fellowships followed at Flinders Medical Centre, South Australia and the University of California, San Diego. Returning to Queensland and to private practice, he set up the Cape York Eye Health Project in 1999 to provide eye health services to the remote Indigenous communities of Cape York, chairing the Indigenous and Remote Rural Eye Health Service for 5 years. Loane was made a Member of the Order of Australia in 2011, particularly for his work with the Indigenous communities of North Queensland. His sporting honours include the Australian Sports Medal and inductions into the Wallabies and Queensland Reds Halls of Fame. ​Joachim Froese is an Australian contemporary art photographer who lives and works in Brisbane and Berlin. Born in Montreal, Canada, he grew up in Germany and migrated to Australia in 1991. He is best known for his highly constructed still life photography, which investigates crossovers with art history, personal memory, portraiture and nature photography. Froese has exhibited widely across Australia, Europe, Asia and North America. His work is included in numerous public collections including the National Gallery of Australia and the Queensland Art Gallery/Gallery of Modern Art and has been featured in international art publications. He has taught photography as a casual lecturer at universities in Australia and Germany for more than 10 years and has been invited to give guest lectures at major universities and art institutions in Australia, Asia and Europe. The Federal Minister for Aged Care and Minister for Indigenous Health, Ken Wyatt AM, MP spoke at the Launch of the Mind Health Report at Parliament House, Canberra on 23 March 2017. I will start by acknowledging the traditional owners of this land and paying my respects to their elders, past and present. I also thank Mind Australia for inviting me today, and for commissioning this report. The report, “The Economic Value of Informal Mental Health Caring in Australia”, provides insight into the impact and importance of informal health caring in Australia. It quantifies carers’ time, effort and impact in providing unpaid care and emotional support for people, who are often close relatives in caring for loved ones with mental illnesses. The report estimates that 240,000 Australians care for adults with mental illness and it would cost $13.2 billion to replace informal mental health care with formal support services. The report also provides insight into the profiles of the carers who are most commonly the carers’ spouses or partners. A majority of informal mental health carers are working-age females and a substantial proportion of mental health carers are young people under the age of 25. In both of my portfolios, aged care and Indigenous health, I am very aware that mental health is a major issue. And I know from talking to people all over Australia, that informal carers are doing an incredible job for people with mental illness, just as they do for people who are physically ill or disabled. This report by the University of Queensland adds to our collective understanding of the extent of informal caring in the mental health space. My view, and the Government’s view, is that the best support for informal carers is to make sure that people needing care can access appropriate health services. Our national mental health reforms are well under way and are starting to make a difference on the ground. The 31 Primary Health Networks across the nation are working with GPs, specialists, hospitals and other health professionals to fill gaps in local services. Since July last year, PHNs have been responsible funding and commissioning primary mental health and suicide prevention services – using a $746 million flexible funding pool. They started by assessing what their regions needed in mental health, and what was available, so they could logically and effectively respond to their people’s specific mental health needs. I equally want to ensure that my constituents in my seat of Hasluck access the right services at the right time. Older people in care are a particular concern. They can become isolated both socially and physically, whether they are at home with a carer or in residential care. That’s why aged care services such as the Community Visitors Scheme, dementia supports, and social support provided through the Commonwealth Home Support Program, are so important. This is an issue I want to keep front of mind as we consider the future of aged care. I’m currently looking to hold a discussion with key sector people on mental health for ageing Australians in May. In short, there is a lot of policy activity under way which will make it easier for people with mental illness to get the treatment and therapy they need. It won’t remove the need for informal carers, who do an invaluable job out of love. This vital role is something I want to make sure we preserve throughout the reform journey. The Government greatly appreciates their efforts, and that is why we made sure that carer representatives were actively engaged in consultations on the Fifth National Mental Health Plan. The plan is set to be endorsed by COAG Health Council in August, and we’ll be listening closely to feedback from carers as we move into the implementation phase of the Plan. The Minister for Revenue and Financial Services, the Hon Kelly O'Dwyer MP, today released draft superannuation income stream regulations and an explanatory statement for public consultation. The regulations, when made, will continue the implementation of the Government’s superannuation taxation reforms and introduce a new set of design rules for lifetime superannuation income stream products that will enable retirees to better manage consumption and longevity risk in retirement. The regulations are intended to cover a range of innovative income stream products including deferred products, investment-linked pensions and annuities and group self-annuitised products. Superannuation funds and life insurance companies will receive a tax exemption on income from assets supporting these new income stream products provided they are currently payable or, in the case of deferred products, held for an individual that has reached retirement. “These new rules will remove taxation barriers to the development of new products that will provide greater flexibility in the design of income stream products to give more choice to consumers, while ensuring income is provided throughout retirement,” Minister O’Dwyer said. “The development of these new products is a precursor to the development of Comprehensive Income Stream Products for Retirement, or CIPRs. The exposure draft regulations and explanatory statement are available on the Treasury Consultation Hub. Submissions are invited by 12 April 2017 and can be sent to superannuation@treasury.gov.au. Eight students from across Australia have earned a once-in-a-lifetime opportunity to experience Anzac Day commemorative services in France and Belgium after being awarded the prestigious Simpson Prize. Minister for Veterans’ Affairs Dan Tehan today presented awards to the winners and runners-up at Parliament House in Canberra. “As a nation we honour the service and sacrifice of the men and women who serve in defence of our nation and the Simpson Prize is a valuable opportunity for young Australians to learn about our history and reflect on how these events have shaped our country,” Minister Tehan said. “This year, students were asked to look beyond Gallipoli and consider the significance of the Western Front battles in helping to shape the Anzac story. “Australians on the Western Front were involved in some of the bloodiest confrontations in our history while enduring terrible conditions and it was in this environment that countless stories of bravery, mateship and sacrifice emerged. The eight winning students (one from each state and territory) will attend Anzac commemorations on the Western Front in France and Belgium in April. Winners and runners-up also received a medallion and a certificate to acknowledge their achievement and are attending a two-day educational program at national institutions in Canberra. Minister for Education and Training Simon Birmingham said more than 1,100 students had submitted an essay or an audio-visual presentation in the 2017 Simpson Prize. “The Simpson Prize is an important way to ensure Australia’s history is recognised by this and future generations of students,” Minister Birmingham said. “That’s why the Turnbull Government has committed $606,000 over three years to the History Teachers’ Association of Australia to manage the Simpson Prize. If you wish to enter the Simpson Prize, please respond to the question below. The Simpson Prize is a national competition for Year 9 and 10 students. The competition encourages participants to focus on the significance of Anzac Day and to consider what Anzac Day means to them and to Australia. Some historians have described 1917 as “the worst year of the Great War” for Australia and Australians. To what extent is this an accurate statement? The Simpson Prize requires you to respond to the quote and question above using both the Simpson Prize Australian War Memorial Source Selection (which can be found at https://www.awm.gov.au/education/simpson-prize/) and your own research. You are encouraged to agree, debate with or challenge the statement from a variety of perspectives – individual, national and global – and to use sources in a variety of forms. You are expected to make effective use of a minimum of three of the sources provided (see link above). Up to half of your response should also make use of information drawn from your own knowledge and research. Submit your entry by Friday 10 November 2017. Please see the How to Enter section for more details regarding student and teacher entry requirements. Note: The Winners of this year’s Simpson Prize will travel in 2018. The competition is funded by the Australian Government Department of Education and run by the History Teachers’ Association of Australia. Western Sydney Parklands’ $15 million Bungarribee Park will be in full swing from Saturday, making it the largest recreational space in Western Sydney since the construction of Homebush’s Bicentennial Park, Environment Minister Gabrielle Upton announced today. Construction of the 200 hectare recreational park, part of the 5,280 hectare Western Sydney Parklands, is complete and will open to the public on Saturday 25 March. “This is an exciting chapter for Western Sydney – generation after generation of families will use this park’s playground, barbecues and open space to create memories that will last a lifetime,” Ms Upton said. Some of the major construction work has included walking and cycling tracks, 20 barbecues, 13 picnic shelters, a playground with climbing tower, slides, a flying fox, swings and balance beams, amenities facility, additional car parking, landscaping, re-vegetation, an off-leash dog park and vehicle access from Doonside Road. Minister for Western Sydney Stuart Ayres said the park’s opening was a fantastic chance to show off one of the state’s hidden gems and to welcome thousands of people to the region. “The park is a fraction of the Western Sydney Parklands corridor which stretches from Blacktown (M7) in the north to Liverpool (Bringelly Road) – by 2031 more than 1 million people will be living on its doorstep,” Mr Ayres said. The wetland around Bungarribee and Eastern creeks will be protected and 20 hectares of native wildflower and thousands of native trees will be planted to restore the Cumberland Plain. Bungarribee Park will add to the list of recreational activities and facilities set among 5,280 hectares of Western Sydney Parklands. This includes Wet ‘n’ Wild, the Atura Hotel, Skyline Drive-In, Sydney Motor Sport Park, Sydney Dragway, Blacktown International Sportspark, Sydney International Equestrian Centre and Sydney International Shooting Centre. Community groups have rejected the latest assessment of the proposed Wilpinjong coal mine expansion project near Mudgee, and called on the NSW Planning Minister to “stop the clock” on the project until the “broken” assessment system is fixed. The NSW Department of Planning has today released its final Assessment Report for the project, again recommending that it proceed, despite fierce community opposition. “According to the Planning Department, my community does not have the right to exist,” said Bev Smiles, of the Wollar Progress Association. “The Department acknowledges that the existing Wilpinjong coal mine has decimated my community over the past ten years, and they acknowledge that the proposed mine expansion would kill us off for good. The problem is, they just don't care. “NSW mining policy is still broken, as the Wilpinjong coal mine project shows clearly,” said Steve Phillips, Hunter regional coordinator for the Lock The Gate Alliance. The NSW National Parks and Wildlife Service (NPWS) is reminding visitors to be aware of accidentally trafficking in exotic pests or weeds to Kosciuszko National Park following a cane toad sighting earlier this month. NPWS Environmental Liaison Officer Dave Woods said a dead cane toad was found by staff in Charlotte's Pass, right near one of the most popular viewing platforms of Mt. Kosciuszko and the Main Range. "The cane toad was found by the side of the road, intact but had obviously been dead for a few days," Mr Woods said. "It's not known whether the cane toad died in transit or had escaped from a vehicle before dying in the area, but the presence of this noxious and poisonous pest is still a cause for concern to NPWS staff. "Aside from the odd sighting, cane toads are not often found in Southern NSW particularly not in alpine environments. "It's highly unlikely the cane toad would survive in this cool climate and its most likely a 'hitchhiker' from up north - but the sighting highlights one of the major concerns for conservation managers which is the spread of exotic animals, plants and diseases," Mr Woods said. While this toad appears to be a lost individual who accidently found itself in the park, cane toads have the potential to introduce a range of diseases such as Chytrid fungus that may infect native frog species. "Nowadays it's very easy for tourists to be camping in tropical Queensland one day, and a few days later be pitching a tent amongst Australia's highest mountains. "Plant seeds can hook to socks, soil pathogens can be transported in mud attached to cars or shoes and cane toads can be unwanted back-seat passengers! "NPWS reminds visitors to check their vehicles for unwanted pest species and to remove grass and seeds from camping equipment before travelling to the park from other areas. Officials from Australia and Germany today signed a Declaration of Intent to establish an Australia-Germany Energy and Resources Working Group. The working group will explore long-term energy strategies in Australia and Germany that create stable investment conditions and increase the energy productivity in both countries, including the diversification of each country's energy supply. It will be an opportunity to learn from each other in addressing the issues we are facing in a transforming energy sector as we move to a lower emissions future. Trade and investment, technological developments and environmental impacts in the resources sector will also be explored by this group. Relevant industry and research communities are expected to play an integral role in meetings and approved collaborative activities. This should result in significant business and collaborative research opportunities for Australia, Germany and their respective regions. The establishment of this group fulfils one of the Australia-Germany Advisory Group's recommendations to strengthen dialogue on energy, energy security and climate change related matters. The Australia-Germany Advisory Group was established in 2014 to identify ways to broaden and strengthen the relationship between Australia and Germany. The Turnbull Government has committed to providing $2.1 million in grant funding to Solar Analytics to fast track smart solar monitoring for residential homes. Solar Analytics, a solar energy software provider, has designed technology to provide detailed analytics on actual solar generation and demand monitoring to ensure consumers know they are getting the most out of their panels. The technology monitors the performance of residential solar PV systems and looks at energy generation against performance expectations, reporting system data back to the householder, while identifying faults and providing corrective actions. The aim is to install the smart solar monitoring technology in 25,000 homes by 2020. The technology increases the energy yield of a rooftop solar system by as much as 15 per cent, providing direct benefit to householders. Consumers are increasingly taking up renewable energy, battery storage and more energy efficient technologies, in order to manage their household energy bills. This uptake is driving change in the electricity market and leading to a more decentralised grid. Technology like this will provide greater scope for consumers to more actively manage their energy use and keep their total energy bills down. Companies like Solar Analytics are contributing towards reducing knowledge gaps for a range of clean industry partners and researchers. The Australian Renewable Energy Agency (ARENA) supports a broad range of development, demonstration and pre-commercial deployment projects that have the potential to lower the cost and increase the use of renewable energy technologies in Australia in the long term. New research supports the creation of more marine reserves in the world's oceans because, the authors say, fish can evolve to be more cautious and stay away from fishing nets. The research suggests that by creating additional "no-take" areas, some fish will stay within marine reserves where they are protected from fishing. While other fish will move around the ocean, these less mobile fish will continue to live in the protected areas, pass this behaviour on to their offspring, and contribute to future generations to increase the overall stock. "Even for fish like tuna and sharks that spend a lot of time far from shore, marine reserves are an important conservation tool," said Jonathan Mee, lead author of the study and a faculty member at Mount Royal University who conducted this research while completing a postdoctoral fellowship at UBC. "We used mathematical modelling to find out under what conditions marine reserves might push fish to evolve to escape capture." In a collaboration between UBC's Biodiversity Research Centre and theSea Around Us project at the Institute for the Oceans and Fisheries, researchers modeled the movements of skipjack and bluefin tuna and great white sharks in the ocean. They found evidence that within 10 years of creating new marine reserves, the movement pattern of tuna could change while it would take up to five decades for the longer-living great white shark to change. They also found evidence that the greater the fishing pressure close to the reserves, the faster the fish would evolve to stay in the protected space. The researchers argue there is a need to create more marine reserves because fishing operations have grown exponentially in recent decades, leading to a global catch decline of 1.2 million tonnes of fish per year. "The boats got bigger and now we can cover the entire range of the tuna. The distance doesn't protect them, depth doesn't protect them, nothing protects them except our decision to remove ourselves from certain areas in the form of marine reserves," said Daniel Pauly, principal investigator of the Sea Around Us project and a co-author of the study. "A well-controlled marine reserve would, at least in part, protect against the effect of overfishing outside the reserve." These findings show fisheries managers, conservation planners, environmentalists and professionals in the fishing industry the effectiveness of marine reserves. "The reserves are likely more effective than previously thought in preventing extinction for some species, protecting biodiversity and even acting as an insurance policy," said Sarah Otto of UBC's Biodiversity Research Centre. Minister for Regional Water, Niall Blair said the NSW Government is delivering on a key Basin Plan commitment with the release of eight Water Resource Plan Status and Issues papers to take place on Friday. “These papers set out issues related to water availability, reliability of access and longterm sustainable use, particularly through times of drought,” Mr Blair said. “I urge all members of the community, particularly water users, to comment on the relevant Status and Issues paper in their region, and submit any additional issues that should be considered in developing a Water Resource Plan. “It is an opportunity to look at existing planning mechanisms and water sharing rules, to identify and resolve any shortcomings, and find ways to be more efficient and productive in the NSW Murray Darling Basin. Status and Issues papers will be released on Friday for consultation in the Barwon- Darling (surface water), Murray-Lower Darling (surface water), Murrumbidgee (surface water), Namoi (surface water), Border Rivers (groundwater), Gwydir (groundwater), Lachlan (groundwater) and Macquarie-Castlereagh (groundwater). Stakeholder Advisory Panels have been established for each surface water plan area – a vital aspect for widespread and meaningful stakeholder and community engagement. The exhibition period will be open from this Friday until Friday 31 March 2017. All written submissions, from brief emails to full technical papers, are welcome. The Marine Estate Management Authority has released the draft statewide Threat and Risk Assessment (TARA) Report for the NSW marine estate. Authority Chair Dr Wendy Craik said the draft report summarises the first statewide evidence-based assessment of the threats to the social and economic benefits of the marine estate and the environmental assets that support them. “The draft TARA report has been developed based on the best available scientific evidence and advice from experts, stakeholders and the community,” she said. Dr Craik said the NSW community had helped identify the social and economic benefits our estuaries and coastline provide, and the importance of the environmental assets that underpin them, during a statewide survey in 2014. “These benefits include recreational pursuits such as swimming or surfing at the beach, boating, fishing, and commercial and tourism opportunities such as shipping, commercial and charter fishing, SCUBA diving and others,” she said. Dr Craik said short videos and an interactive tool are being provided to facilitate community feedback and discussion by presenting the report results in a user-friendly way. “We are committed to managing our marine estate for the benefit of the community, and this report and the process is designed to support and encourage participation,” she said. The final report will inform the ongoing management of the NSW marine estate through the drafting of a new 10-year Marine Estate Management Strategy. It will also be considered in the creation of new management plans, starting with the Solitary Islands and Batemans Marine Parks. The draft TARA report includes revised findings for the Hawkesbury Shelf marine bioregion, now called the ‘Central Region’. The draft report delivers on a key commitment of the NSW Government, to provide evidence-based management of the NSW marine estate, and is a requirement of the Marine Estate Management Act 2014. The draft report, background reports and other supporting material are available at NSW Marine Estate Authority. Ten national peak not-for-profit health organisations making up the Neurological Alliance Australia (NAA) are calling for the National Disability Insurance Scheme (NDIS) to transform the lives of over 850,000 Australians living with progressive neurological or neuromuscular conditions that have no known cause and no cure, outlined in a Joint Position Paper, People with progressive neurodegenerative diseases in the NDIS, which accompanies this release. Dealing with progressive neurological or neuromuscular conditions comes at an annual cost of almost $30 billion to the Australian economy. Deidre Mackechnie, CEO of MS Australia and NAA Chair says the NAA is an alliance representing adults and children living with progressive neurological and neuromuscular diseases in Australia. The Alliance was established in 2010 to promote improved quality of life, coordinated services and greater research investment. “The impact of progressive neurological conditions on individuals and families can be significant both financially and emotionally and can have a huge impact on their ability to remain engaged in their community to maintain a life of meaning and purpose,” continues Ms Mackechnie. The NAA believes that the NDIS has the ability to transform the lives of people living with progressive neurodegenerative diseases and has promoted and supported the Scheme since its inception. To date, some NDIS participants have received plans that have had positive, life-changing impacts on their lives, however, many others have received insufficient plans that will adversely affect their quality of life and place some at risk of avoidable hospitalisation. The needs of people with a progressive neurodegenerative disease be addressed in the Productivity Commission’s upcoming Review of NDIS Costs. Ms Mackechnie says, “The NAA remains an advocate of the NDIS and understands the roll out of this Scheme is one of the greatest changes to healthcare since the introduction of Medicare. However, if people with a progressive neurological disease are to receive equitable and effective support within the NDIS it is imperative that the NDIA and government addresses these unmet needs. The recommendations outlined in the Position Paper launched today will go a significant way to aligning the original intent of the NDIS with its practical application”. Patients who need the most support will save as much as $200 a week on public hospital parking fees under changes to be introduced by the NSW Government. Premier Gladys Berejiklian and Health Minister Brad Hazzard have today announced that more patients and carers will be able to access hospital parking concessions from July 2017. Concessions will also be extended to every public hospital car park in NSW where fees are applied, including those run by private operators. “These are significant changes that will result in real savings for the patients and families who need it most during the toughest times,” Ms Berejiklian said. For example, a patient suffering from a rare blood disorder and requiring daily transfusions at St George Hospital would pay $21.20 per week under the new policy, instead of up to $231 per week where no concession has been applied. Similarly, parents who have to stay with their chronically ill child through the day at Sydney Children’s Hospital, Randwick, would pay $21.20 per week instead of $196 per week. “These changes will make parking concessions at NSW hospitals the most generous in Australia,” Mr Hazzard said. The NSW Government has listened to the concerns of patients such as 14-year-old Gidon Goodman, who was inspired by his own experience as a long-term patient at Sydney Children’s Hospital to campaign for fairer parking fees. “These changes will positively affect the lives of hundreds of thousands of people and will be life changing for those who have been the victims of hospital parking in the past,” Gidon said. The new concessions are expected to be implemented from July 2017, following negotiations with parking providers. Other important changes to the policy include simplifying the concession application process in each local health district and better communication with patients and their families. Each hospital would display signage in car parks advising patrons of concession rates available and how to apply for them. This information would also be available on all local health districts’ websites and in pamphlets made available in the hospitals. NSW Health is also developing a smartphone app that will make it easier for hospital visitors and patients to access information about car parks at public hospitals. UNSW researchers have identified key reasons why some doctors continue working beyond retirement age, despite evidence suggesting their performance is more likely to decline. In Australia in 2014, nearly 10 per cent of the medical workforce was over the age of 65. This marked an 80% increase from 2004. Currently, there are some 1700 employed doctors in Australia aged 75 and older. While older doctors can occupy important roles in the profession as teachers, mentors and leaders, potential benefits must be weighed against a “complex array of factors associated with ageing” that could hinder optimal performance, the researchers say. “Whilst the psychological health of older doctors who are still practising tends to be better than that of younger colleagues, there are demonstrated declines in their cognition and patient outcomes,” said Dr Chanaka Wijeratne, from the UNSW School of Psychiatry. Dr Wijeratne and colleagues recently surveyed 1048 Australian doctors aged 55 and over to better understand the professional and psychosocial factors influencing their retirement decisions. Their results were published this week in the Medical Journal of Australia (MJA). The researchers found that 38% of respondents had no intention to retire or were uncertain about their future retirement plans, and that the likelihood of retirement was most consistently predicted by two factors: the idea of work being a central component to their life, and their financial resources. The results suggest the odds of retiring were lowest for doctors who saw their work as a central part of their life, and who had greater “emotional resources” such as better self-esteem and positive self-perception of their cognitive abilities. International medical graduates also retired later, but researchers say this was due partly to their delayed entry into the workforce. On the flipside, the survey results indicate that doctors with concrete intentions to retire, particularly those 65 and older, had achieved greater financial security and were more anxious about ageing. The survey was sent to 6000 Australian doctors aged 55 and older in October 2015 and 1048 responses were considered valid. Respondents were asked to provide information about their demographic and professional details, education, medical specialty, geographic location, their typical hours and type of practice. They were also asked to self-assess their physical and psychological health, and to indicate their intention to retire, along with the preferred age and a ranking of factors contributing to their decision. The researchers say their results will inform the development of educational resources to help doctors more effectively plan for their retirement. The MJA also published a related editorial piece by Professor Brian Draper from the UNSW School of Psychiatry, who studies mental health problems and cognitive decline in old age. Draper argues that doctors need to plan for retirement earlier in their careers as financial insecurity is one key factor keeping them in the workforce in late life. While doctors working in the public sector are likely to have superannuation schemes with employer contributions, Draper says it can be more difficult for self-employed doctors, particularly general practitioners, to secure a stable retirement income. He says the benefits of having older doctors in leadership and teaching roles are “counterbalanced by evidence that they have less factual knowledge, are less likely to adhere to standards of care, and may also achieve poorer patient outcomes”. Draper notes that the Medical Board of Australia is currently considering implementing a revalidation system, which would require healthcare professionals to prove their skills and knowledge are up-to-date. He also highlights that the Royal Australian College of Surgeons (RACS) has changed its continuing professional development (CPD) regulations, requiring doctors to have their own GP and to undergo regular health checks. He says these measures are needed, and that CPD programs should promote whole-of-career planning strategies, feedback from patients and peers, and age-related performance evaluations, which can proactively detect declines (or risks of decline) in a doctor’s performance in certain tasks. “This will help us reduce instances of decreased performance, and could help doctors transition their practice into areas where their skills are still appropriate and valuable,” says Draper. “You may not want a 75-year-old to be doing precise microsurgeries, but they may be perfectly suited to certain roles, and may even outperform younger doctors. Sensibly, the federal government abandoned plans to privatise the database of the corporate regulator just before Christmas. Almost inexplicably, the New South Wales government continues to pursue its plan to privatise the state’s land titles registry. We say “almost” because this deal is explicable only in that it will raise a projected A$1 billion to A$2 billion for the state budget. It is a one-off transaction to finance the upgrade of two football stadiums. It utterly defies logic. Privatising a government monopoly, an essential service with zero competition, defies logic full-stop. In this case, besides the loss of jobs, besides the loss of a reliable $130 million a year dropping into state coffers, besides the loss of security for critical information – perhaps to an offshore private equity group – and besides the spectre of rising litigation costs, there is the matter of tax. It is reasonable that voters demand of their elected officials to know where their assets may end up and who might own them. Will the profits of the NSW Land and Property Information Office (LPI) end up in a tax haven in an entity controlled by a financier of weapons? The notorious Carlyle Group is one touted bidder. So “on the nose” is the proposal to auction off the LPI via a 30-year lease that the Law Society, the Real Estate Institute and the Institute of Surveyorshave come out against it, as have staff and myriad other stakeholders. Despite trenchant opposition to the NSW sale, South Australia is also tinkering with the idea of privatising its land titles office. The other states are watching on. When it comes to leasing things to tax havens, state governments have form. In both Victoria and South Australia, electricity networks have links to tax havens. In NSW, too, some 40% of the Transgrid electricity sale last year went to two entities domiciled in the Cayman Islands. The secrecy shrouding the auction of the LPI means the actual corporate entities lurking behind each bidding syndicate remain a mystery. Borealis Infrastructure’s Teranet, and Computershare. Stakeholders in the state of NSW concerned about sensitive details of who owns what land, and how the state is divided up, have good reason for concern. Then there is the bidding combination of Macquarie Bank and Link Group. The former is well known for the aggressive tax structures of its infrastructure plays such as Macquarie Infrastructure Group (sold to Transurban), Thames Water in the UK and Sydney Airport. It would be good policy, besides the basic political courtesy of a transparent auction process, that any privatised asset not end up in a stapled-security trust structure. For one, it is incumbent on the members of the trust rather than the trust itself to pay income tax, although members of these structures typically pay a tax rate of 10-15% rather than the 30% company rate. Selling to a trust therefore means one-third to one-half the normal corporate-rate tax is paid. Further, private buyers are attracted to essential government services for the stability of their income; and so they can gear it up with debt to further reduce tax. It is not as if the LPI can go bust. Link Group, part of the Macquarie consortium, is listed on the ASX. Over the past two years it has booked A$1.5 billion in cashflows and paid just A$2 million in tax. The Hastings Funds Management, Advara and First State Super syndicate looks the cleanest in terms of tax. Though super funds pay half the corporate rate, at least tax is paid. The fourth syndicate of Borealis Infrastructure’s Teranet and Computershare is a mixed bag on the tax front. Although Computershare pays large licks of tax in Australia, it also has a quiver of tax haven connections from Jersey, Guernsey, Bermuda and the Cayman Islands, to the British Virgin Islands, Ireland and the Netherlands. For its part, Borealis is a Canadian leveraged buy-out firm, which bids for public infrastructure and loads it heavily with debt, often from an associate at suspiciously high interest rates. It is noted for wiping out taxable profits in the UK thanks to big loans from its own subsidiaries. In the broader context, there has been an insidious creep in state secrecy over privatisation and the use of taxpayer funds, as evinced by the A$1 billion of taxpayer funds being deployed to finance a rail line for Adani’s coalmine in Queensland, a mine whose corporate entities have tax haven connections. The least politicians could do is to insist, as a prerequisite of sale, that all bidding proposals see the light of day before any deal is done, and that all bidders are required to use an Australian corporation with no tax haven parentage. The 26th International World Wide Web Conference returns to Australia for the first time since 1998 and will be hosted by Perth, a beautiful, progressive city and one of Australia's major gateways to Asia and the world. The conference will run April 3-7, 2017 and feature four streams around the evolution of the web, technical standards, the impact of the web on society, and its future. Connecting all four streams will be themes of eLearning, remote services, security and privacy. A W3C technical stream will review and consider web standards and the impact and needs of a rapidly-expanding web universe. Accompanying the world-class conference will be a range of co-located events to broaden the experience of those attending. The National Native Title Tribunal is celebrating the 25th Anniversary of the Recognition of Native Title. We are pleased to announce our website www.nativetitle25.gov.au. has been published, which provides stories, images and videos discussing native title over the last 25 years and the benefits it has supported. You are also welcome to make contributions to the website, which will be added to over the year. Keep up to date with new features and other anniversary celebrations throughout 2017 by following us on Facebook and Twitter. The Government Party Room this morning agreed to reforms to the Racial Discrimination Act 1975 (the RDA) and the Australian Human Rights Commission Act 1986 (the AHRC Act), which will strengthen Australia's anti-vilification laws, enhance freedom of speech and improve the complaint-handling processes of the Australian Human Rights Commission (the Commission). These reforms follow the release of the Report into Freedom of Speech in Australia by the Parliamentary Joint Committee on Human Rights on 28 February. The legislation will remove the words "offend, insult, humiliate" from section 18C of the RDA and insert the word "harass". It will also introduce the "reasonable member of the Australian community" as the objective standard by which contravention of section 18C should be judged. Amendments will also be made to the AHRC Act to facilitate the disposal of unmeritorious complaints and ensure fairness is accorded to both complainants and respondents. The legislation will raise the threshold for the Commission to accept a complaint, provide additional powers for the Commission to terminate unmeritorious complaints and limit access to the courts for unsuccessful complaints. Minor technical amendments, identified by the Commission itself, are also included to improve the Commission's reporting obligations, its conciliation processes, and governance arrangements. There has been a great deal of public discussion in recent times about the protection of freedom of speech in Australia. That discussion has focussed, in particular, upon s. 18C of the RDA, and on the way in which the Commission deals with complaints. The recent cases of the students at QUT, and the complaint against the late cartoonist Bill Leak, have brought the issue to even greater prominence. In its report Traditional Rights and Freedoms, tabled in March 2016, the Australian Law Reform Commission said that "Part IIA of the Racial Discrimination Act, of which s. 18C forms part, would benefit from a more thorough review in relation to freedom of speech". In November last year, the Australian Human Rights Commission asked the Government to propose "amendments to streamline the processes by raising the threshold for accepting complaints". The Government's reforms strike the right balance by strengthening the protections against hate speech based on race, whilst enhancing freedom of speech. They ensure that unmeritorious complaints are terminated and respondents are not put to great personal and financial cost. Reforms to the Commission's complaint handling procedures are sensible and the overwhelming majority are supported by the Commission itself. These measures will restore public confidence in the Commission's processes, whilst reducing its regulatory burden. Submissions are invited by 12 April 2017 and can be sent tosuperannuation@treasury.gov.au. The Federal Government is proposing greater flexibility for coastal shipping and new training opportunities in a discussion paper aimed at boosting coastal shipping activity. Commonwealth Government is seeking comment from ship operators, shipping companies, and other relevant stakeholders on proposed changes to ensure coastal shipping plays an increasing role in Australia's freight transport network. Releasing the government's Coastal Shipping Reforms Discussion Paper today, Minister for Infrastructure and Transport Darren Chester said coastal shipping could take long distance cargo off our highways and railway lines to ease future freight demands on the national transport network. “Currently, 15 per cent of Australia's domestic freight is moved by ship, but with Australia's extensive coastline and broad network of ports, there is the potential for shipping to play a larger role in the national freight task,” Mr Chester said. “However, it has become clear that limitations in the current regulatory system are working against that potential being realised. “We need to address a range of administrative issues in the Coastal Trading (Revitalising Australian Shipping) Act 2012, which place unnecessary burdens on shipping companies and the Australian businesses that rely on coastal shipping. “The intention of this discussion paper is to elicit views about how modifying the Act could help to redress this situation, without changing the basic structure of the current coastal trading regulatory regime. “The discussion paper also proposes the introduction of a number of seafarer training initiatives aimed at developing and retaining critical maritime skills in Australia,” Mr Chester said. Written submissions to the discussion paper should be sent toshipping@infrastructure.gov.au by Friday, 28 April 2017. What sounds like a stomach-turning ride at an amusement park might hold the key to unravelling the mysterious mechanism that causes beams of radio waves to shoot out from pulsars -- super-magnetic rotating stars in our Galaxy. New research from Curtin University, obtained using the Murchison Widefield Array (MWA) radio telescope located in the Western Australian outback, suggests the answer could lie in a 'drifting carousel' found in a special class of pulsars. Curtin PhD student Sam McSweeney, who led the research as part of his PhD project with the ARC Centre of Excellence for All-sky Astrophysics (CAASTRO) and the International Centre for Radio Astronomy Research (ICRAR), described pulsars as extremely dense neutron stars that emit beams of radio waves. "These pulsars weigh about half a million times the mass of Earth but are only 20km across," Mr McSweeney said. "They are nicknamed 'lighthouses in space' because they appear to 'pulse' once per rotation period, and their sweeping light signal can be seen through telescopes at exceptionally regular intervals." Thousands of pulsars have been seen since their first discovery in the late 1960s, but questions still remain as to why these stars emit radio beams in the first place, and what type of emission model best describes the radio waves, or 'light', that we see. "The classical pulsar model pictures the emission that is shooting out from the magnetic poles of the pulsar as a light cone," Mr McSweeney said. "But the signal that we observe with our telescopes suggests a much more complex structure behind this emission -- probably coming from several emission regions, not just one." The 'drifting carousel' model manages to explain this complexity much better, describing the emission as coming from patches of charged particles, arranged in a rotating ring around magnetic field lines, or a carousel. "As each patch releases radiation, the rotation generates a small drift in the observed signal of these sub-pulses that we can detect using the MWA," Mr McSweeney said. "Occasionally, we find that this sub-pulse carousel gets faster and then slower again, which can be our best window into the plasma physics underlying the pulsar emission." One possibility the researchers are currently testing is that surface temperature is responsible for the carousel changing rotation speed: localised 'hotspots' on the pulsar surface might cause it to speed up. "We will observe individual pulses from these drifting pulsars across a wide range of radio frequencies, with lower frequency data than ever before," Mr McSweeney said. "Looking at the same pulsar with different telescopes simultaneously will allow us to trace the emission at different heights above their surface." The researchers plan to combine the data from the MWA, the Giant Metre-wave Radio Telescope in India and the CSIRO Parkes Radio Telescope in New South Wales to -- literally -- get to the bottom of the mysterious pulses.